increased lifetime of bearings, belts etc. Statistics show that between 20-30% of machine faults are caused by some types of misalignment. In these cases the belt wears out faster and the stress on bearing is much bigger, which considerably inceases the temperature and reduces the lifetime of bearing, drive belts, chains and components. Illustration 1. Illustration 2. Illustration 3. Illustration 4. 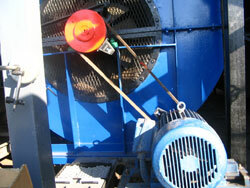 The aligning system consists of two identical units that need to be attached to the pulleys by magnets. Each unit generates a laser line on the opposite mounted unit's target. The adjusting of the pulleys lasts until the laserline aligns with the target, and the driving and driven machines (fan, compressor, pump etc.) are accuratly aligned. 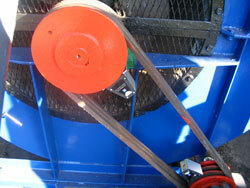 This is a fast, easy and reliable method of accurate alignment of belt drive pulleys.